Everything about Kitty Kastle shows that we really know cats. The separate environmental system and the extraordinary kitty condo features were all designed with your cat's preferences in mind. Cats like it warm! The entire Kastle is on a different heating and air conditioning system from the "dog area" so we can keep the temperature purrrfect for our kitty guests. 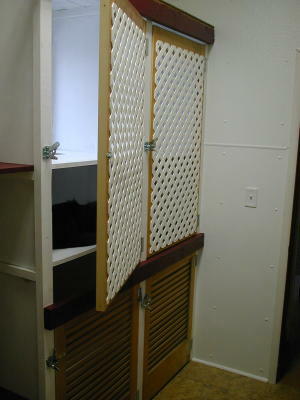 Large private Kitty Condos with special feline features. Each condo is completely private, with perches on different levels for sleeping, basking in the sun or meals. There is nothing cats like more than sitting in a sunny window watching the great outdoors. 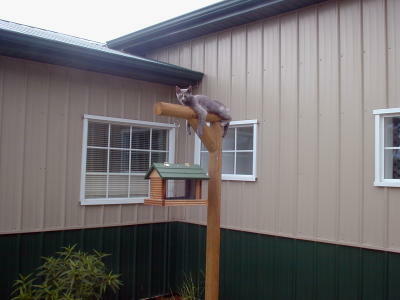 Every cat condo has a perch with a view of our special bird activity center - live kitty TV! 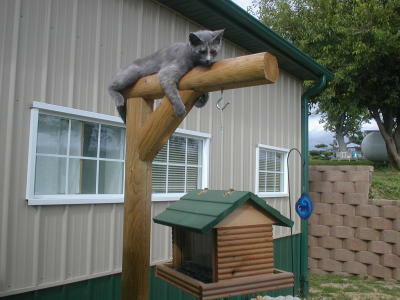 Kittie Condos are 8 feet tall, 30" wide, 30" deep, for an area of 50 cubic feet for Kittie to enjoy. 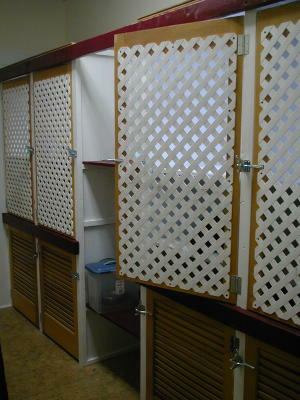 Each Condo has four levels, a private, louvered area for the litter area, as well as a second private area for sleeping. Another level contains the water and food area and a fourth level has a sunning and lounging area with window access. Each condo has privacy, entertainment, sunshine and lots of space to rove and enjoy. Kitties love the multiple levels, and being able to explore. 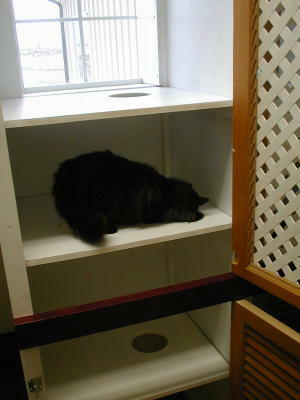 Each condo also features a sheepskin bed, or you are welcome to bring your kitty's own bed. Sociable kitties visit with us and enjoy spending time in our office, hanging out and being spoiled. Our resident kitty Patches shows the boarders how to bird watch "properly" - she is such a stinker!